This Festival Fringe marks one year of Steven Brett (Theatre Manager) and Kate Gowar’s (Theatre Producer) tenure of the Nightingale. During this exciting year we have emphasised a vital and strategic shift in moving away from the name The Nightingale Theatre and re-imagining the venue as the Nightingale: making reference to the ‘hotel’ it was originally. The spaces within the Nightingale, now open for the development of work and performance, have reverted to their original function names: the theatre - the dining room, the dressing room - the kitchen, the green room - the smoking room, and the flat on the third floor and all its rooms - the hotel. Performances are now placed in the Grand Central bar downstairs and off-site. The aim of this contextualisation is to give both audience and performer a sense of the building itself, and allow for unique and surprising engagements with work. “Telling it how it is even when you don’t quite know how it was.” A stripped back performance incorporating story telling, dance theatre and Afro-Brazilian percussion set in the intimacy of a bed-sit. A collage of moments from the lives of three generations of men, the piece explores ideas surrounding ritual, ancestry and the magic of coincidence. This is just to say is a conversation about manipulation, Britishness, love and winning This is just to say is instillation art, performance poetry and good company This is just to say is smudging its make-up, buying bouquets and screening your calls An intimate piece set around a table. Pull up a chair and drink some wine. Let the Nightingale lead you around some of Brighton’s homes to experience a remarkable sequence of intimate performances. You may find yourself in a living room, a kitchen or even on a street corner. Wherever you are, keep your eyes wide open as you may be surprised by where you happen upon them! Mandana grows letters in her field. The availability of letters, enabling her to talk, depends on season and harvest. She crafts her sentences delicately, allowing you to enjoy the silence between the words. She sprinkles rose petals into a freshly made pot of tea. Hold a warm cup in your hands and embark on a journey to the present moment. 1941, the darkly comic novel is set in 1939 in the countdown to the outbreak of the Second World War. Drenched in ecstasy and anguish, ex-contemporary dance star, Matt Rudkin, shares his tale of artistic salvation through the exertions of riot duty training and the love of an immigrant hula-hoopist. This stand-up and dance-about comedy combines deadpan wordplay and expert physical tomfoolery in a heartfelt homage to those heroic geeks who dance without fear, subverting the norms of cool. Do you have friends who make you pose for photographs whenever something happens? What is so terrible about forgetting? Personal stories capturing intimate moments that change everything, inspired by conversations with gay people. A collage of humour and heartbreak told through storytelling, music, film and dance. *****Three Weeks–an intimate journey into the underbelly of love, one life-altering discovery and those moments after. 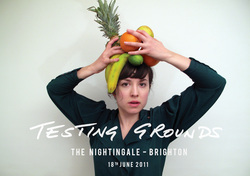 The first instalment of Stillpoint’s trilogy of female solo works, Triptych–followed at the Nightingale Theatre by Steal Compass, Drive North, Disappear (Fringe Review Award 2010 ‘Outstanding Theatre’); and concluded in this year’s final instalment The Growing Room, a Brighton Festival 2010 premiere. Paris 1945. Christiane waits for a ticket to England that will reunite her with her fiancé. While she waits, this irrepressible mademoiselle recounts the love story between her - an eccentric, acutely-myopic Parisian - and a tongue-tied English teacher from Staffordshire. A tender, comic portrayal of one woman's experience of love and war. Best Solo Performer, The Stage Awards 2010. A provocative, poetical happening. Roy Hutchins performs new, short poems by Heathcote Williams (Whale Nation, Autogeddon). Heathcote’s acute observations on life and death, politics and society, people and places ask big questions in short-form. He takes listeners on an imaginative, rollercoaster journey. Roy’s distinctive voice brings them alive with an engaging theatrical flourish. “Mesmeric delivery” The Guardian (on Whale Nation). Fringe Review Award 2010 for 'Outstanding Theatre' –a show about a man’s struggle to balance love and lust. The second instalment of Stillpoint’s trilogy of female solo works, Triptych –preceded at the Nightingale Theatre by The Art of Catastrophe (5* Three Weeks); and concluded in this year’s final instalment The Growing Room, a Brighton Festival 2010 premiere. Al is searching for a tropical rainforest. In Northumberland. The Station:Fourstones is the journey of a man trying to connect with a family he never knew existed. Ridiculous, poetic, sad and beautiful this one man expedition proves to be an adventure doomed to fail but willed to triumph. “first-rate writing performed by a supremely talented actor” Bristol Evening Post. A long, dark night, a telephone, faceless voices in the ether. A solitary soul struggles to lend life support to the needy over a very crowded night... By the wee small hours, she's starting to see the light. A darkly wry, funny and deeply human look at the art of living close to the edge. Celebrity. Scandal. Monkeys. Opera! When legendary Tenor Enrico Caruso is accused of pinching women's bottoms at the Central Park Zoo in New York, it's not his reputation but his whole career that's at stake. With text drawn from contemporary newspaper accounts, the audience plays the jury and must pass judgement: Did Caruso commit an act of gross indecency? Was he a notorious womaniser or the victim of police entrapment? Prodigal's opera hero returns to the Fringe in a new collaboration with Andrew G Marshall. Featuring live singing from Puccini and Verdi. "Magnificent" Three Weeks "Compelling" Stage "Opera singing with a pure fresh quality" Scotsman. Ticket allows you stay as long as you like and re-enter at any point, as often as you like, on a one out/one in basis. For two nights the Nightingale will treat you to a terpsichorean marathon. Come, stay as long as you like and know that you will have a special dance experience. Artists will have come from far and wide and include new works from local favourites in classy line-ups of artists. The dance Marathons are drop-in and stay as long as you like performances. Re-enter at any point, as often as you like, on a one out/one in basis. Cinema, books and cartoons rolled into one: beautifully illustrated stories on the wall. See, listen, even read! Sold out in 2010. Profits go to the National Literacy Trust. Age: 3+ There might even be popcorn! Rules are what you make them. In a remote community of women, miles away from a world of war, the routines of a new religion prosper - until the soldier arrives. A play that asks; if you see the world differently, can you yourself ever be seen? An informative, realistic and entertaining evening with author Isabel Losada (100,000+ copies sold, translated into 16 languages). Isabel draws on her own experience to offer her honesty, wisdom and every tip she can think of for experienced collectors of rejection letters, those with their novel still under the bed and anyone who has yet to put pen to paper. The event includes a Q&A section. Isabel is the author of The Battersea Park Road to Enlightenment, For Tibet With Love and her new book (The Battersea Park Road to Paradise) is published on May 12th. Devon, Bound is the bracingly physical tragic comedy from Bear Trap Theatre Company. Bound on a National Tour of the UK. Advertiser Critics Choice Award and Best Theatre Performer (ensemble). From Copernicus to Galileo; from the electron-microscope and the x-ray; from cinema to home-television and the internet - the discovery of new looking-devices and their implications in popular consciousness have been instrumental in drastic paradigm shifts across human history. They continue to transform the way we think about ourselves, our relationships to each other, to nature, the world, the universe… at every level and scale - rendering the world in evermore fascinating and mysterious detail, whilst concealing reality beneath layer upon layer of images. Discovering new ways to see and imagine can permit us to zoom-in to the minutia of everyday life and peer beneath the surface of our commonly held assumptions – and to zoom-out, feel from a much bigger cultural frame and learn from what was previously overlooked or beyond our habitual field of view. In this way revealed forms become attitudes, bridging the gap between the unnoticeable and the obvious, and the hidden struggles between defiance and resignation. The three new artist’s works commissioned for this edition of Testing Grounds share the quality of constructing a looking device - literally and metaphorically. So how does one achieve this kind of metonymic lens from the ephemeral time-based gestures inherent to live art and performance art?